The lobular gores, the lack of uprights (and, therefore, the helmets of the crew!). Even without the big, square skirt, this early model is unmistakable as a Piccard. 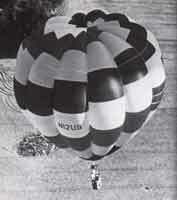 Don Piccard is widely acknowledged as the "Father of the Sport of Hot Air Ballooning." From a storied family of aeronauts, and quite an accomplished flier himself, Piccard was a fervent promoter of the sport before anyone would have called it one. 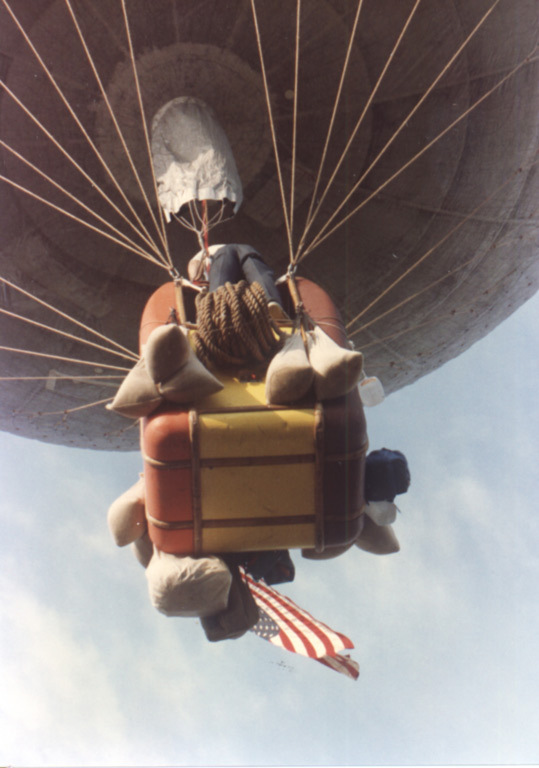 You will simply not see a photo of more than a few early balloons in America without seeing at least one or two Piccards. 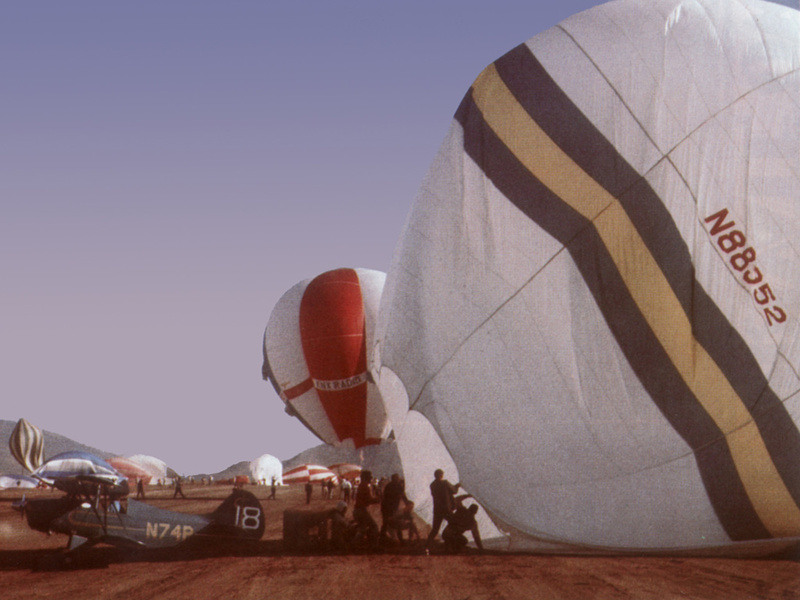 Don Piccard Balloons, although only run by Piccard himself for a portion of its history, was not only an early market leader in America and elsewhere, but an industrywide standard-bearer for safety during sport ballooning's formative years. Important as these balloons were, I don't have much material on their construction - baskets, burners, envelope details, etc. If you have material you think would make this a better Piccard page, please write me, the better to do justice to these seminal aircraft. Meanwhile, before you even look at this page, you should visit Don Piccard's own page about his balloons. You'll find photos of many important early Piccard balloons, both hot-air and gas, including the first-ever bulbous-gore balloon, and a 1.2 million cubic foot balloon built for oil drilling in 1967. These are the sorts of images I'd hoped I'd have on this page by now, but as long as they're available somewhere, I'm happy. TIP: Try saving the images to your hard drive - most are MUCH bigger than they display on the page! 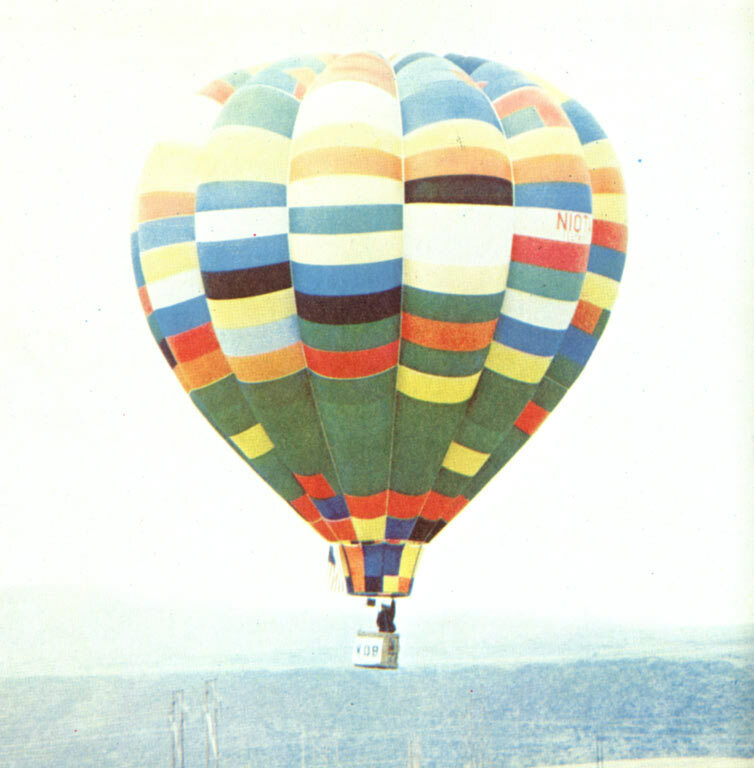 A latter Piccard lifts off at the 1980 Fiesta (I'm a sucker for those black load tapes). 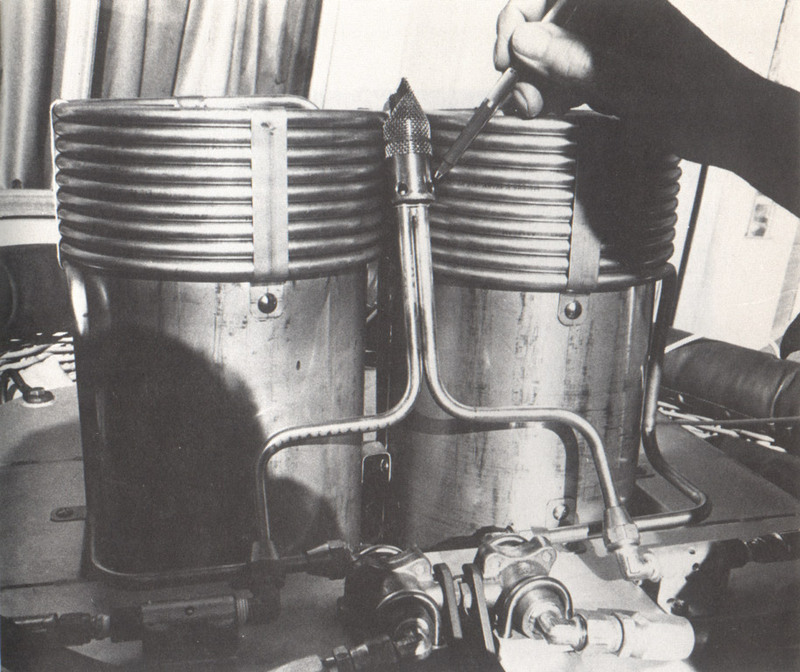 Don Piccard himself, along with one of the few really good shots of a Piccard burner out there. 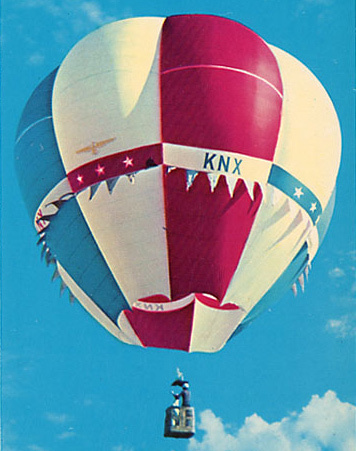 At the '65 Nationals in Reno, Don Piccard in "KNX" and Don Kersten in "Merope" (foreground) won the timed-inflation event handily, with the aid of the world's biggest inflation fan (registration no. N74P). A sight every Piccard pilot will remember fondly (provided the helmets weren't riding around in the chase truck at the time). 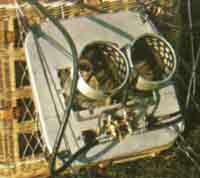 A Twin Seven burner, sporting an independent dual pilot light with separate dual vapor services. By '79, this stout-looking 2-can burner kept Piccards aloft. This AX-4 was built for solo flight, but often flew with two people in its tiny basket. 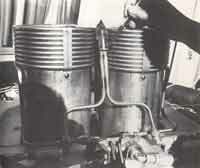 A few early Piccards had this funnel-shaped skirt. Here is a closeup of the same balloon undergoing a laborious inflation, and Here is a so-so shot of an even more funnel-like Piccard skirt. Some skirtless Piccards had huge gaps between burner and bag. Simpson College, host of the U.S. Nationals in Indianola since time immemorial, chose a Piccard to fly its colors, circa '79 or so. General Balloon Corp. (maker of Piccards) built the envelope for this "Hangstat" in about '78 (though you'd never know it from the Raven-like smooth gores). 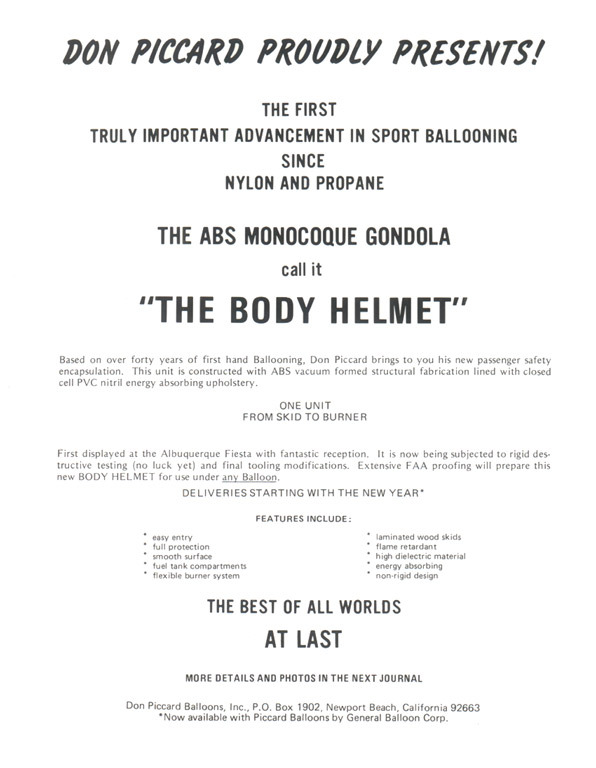 Piccard built a few ABS "Monocoque" ("Body Helmet") gondolas. 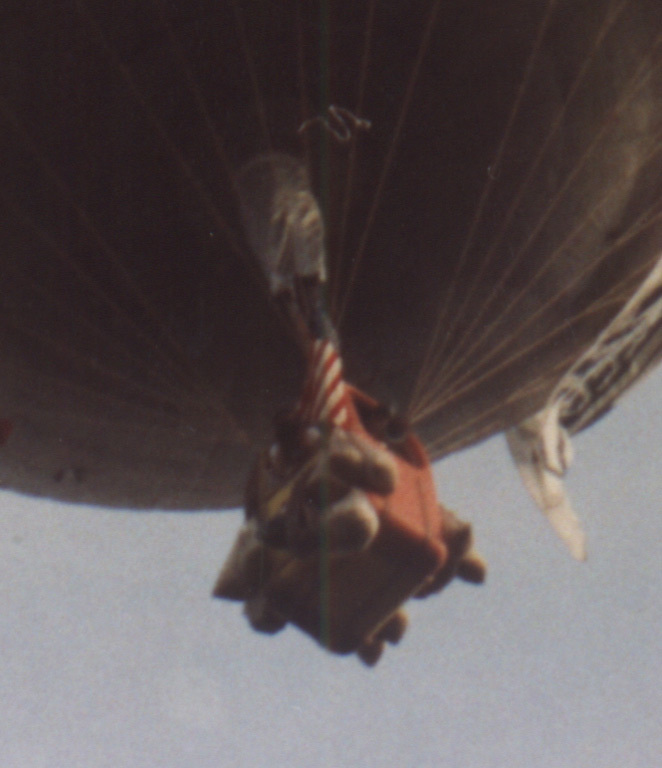 Here's one on a gas balloon piloted by Don Piccard and Leslie Pritchard in the '80s. (Here's (I think) a better shot of the Monocoque (but Mr. P. doesn't like it as well), Magazine ad from '79.) 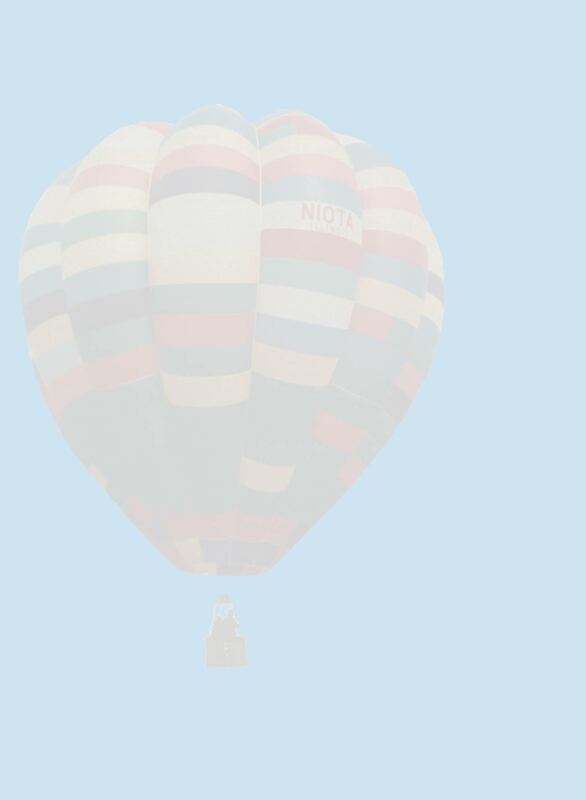 I sure never saw one on a hot-air balloon - an image of one (or any other images of one) would be eagerly welcomed! Don Piccard created the limited definition of the "Modern Hot Air Balloon" as "Any propane fired nylon fabric balloon" for Raven's P. R. so that Raven could claim the "First." It actually had nothing new of appreciable value. The Rev. Bacon in England in 1903, the Marek and Emmer balloon in Austria and the Berliner balloon in Germany, both in the 1930s and Col. Huber in Switzerland in the 1940s, all were superb navigable hot air balloons. They only lacked the vision of appropriate utilization of their unique capabilities. The difference was in the utilization of the balloons' unique capabilities as differentiated from the traditional gas balloon. Bacon was interested in military observation, but the next season the Wright brothers solved that problem and Bacon happened to die shortly after. 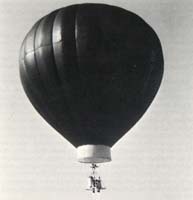 The later efforts used the balloon as a gas balloon for extended high altitude cruising. Don Piccard drew on his family lore of the Swiss Aero Club ballooning of the early 1900s and his own experiences in the U. S. Navy in WWII. 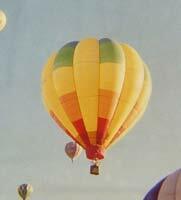 Low altitude flying with many touch and goes is heretical to gas ballooning. 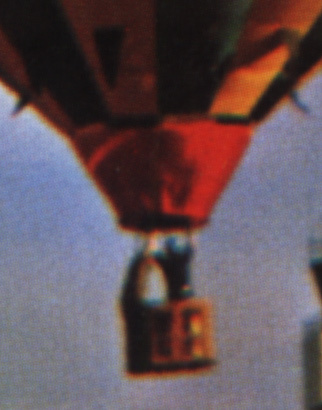 Frankly, hot air ballooning was a threat to the monopoly of the existing cadre of gas balloonists, "Aeronauts." In soaring gliders, one is fixated on looking for thermals. 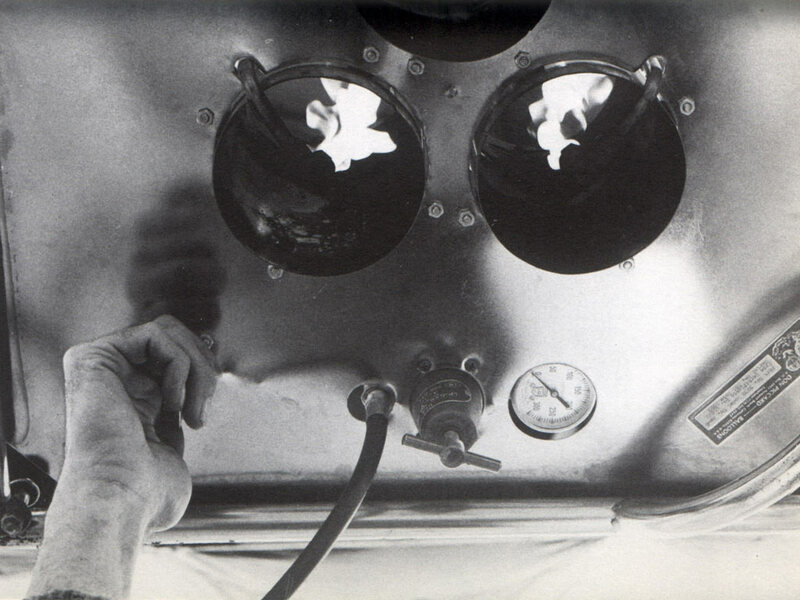 In gas ballooning, one is preoccupied with conserving ballast. Both are to prolong the flight. 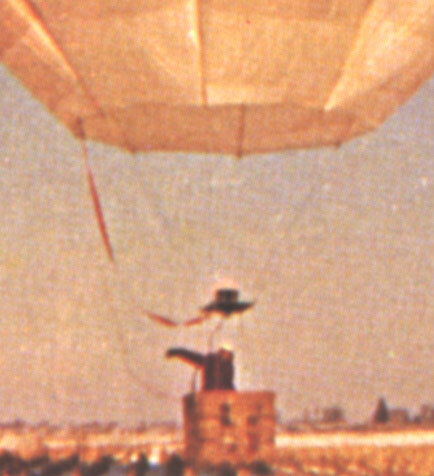 Low altitude horsing around is not "Ballooning" as viewed by Fred Dolder, the dean of European gas ballooning. WWII Navy ballooning did not have the costs (to the pilot) of low flying, but did have the sport. Piccard saw in the navigable hot air balloon a vehicle to meet these services. A hot air balloon can make economical short flights when the conditions are available. Low altitude short flights with numerous touch and goes are ideal for varied and exciting competitive events. A whole new facility was available. 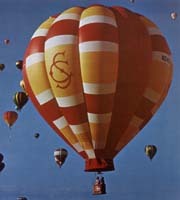 Ballooning in general, and hot air ballooning in particular, did not have an attractive reputation as a gentlemen's sport. The reputation of carnival smoke aerialists and wacko Hollywood spectacular exhibitionists shied any responsible citizen away from ballooning in general. The opportunity to change this came in the form of St. Paul, Minnesota's premier civic function: the sanction by John Geisler of the St. Paul Winter Carnival and sponsorship for a sterling silver Revere bowl. This was followed by George Lowry's Kalamazoo Chamber of Commerce sponsorship of the world's first balloon championships and an even larger silver bowl. The logarithmic growth of the sport was assured. Now, even the gas balloonists have championships! I gratefully acknowledge the invaluable assistance of Don Piccard in checking the accuracy of this page. 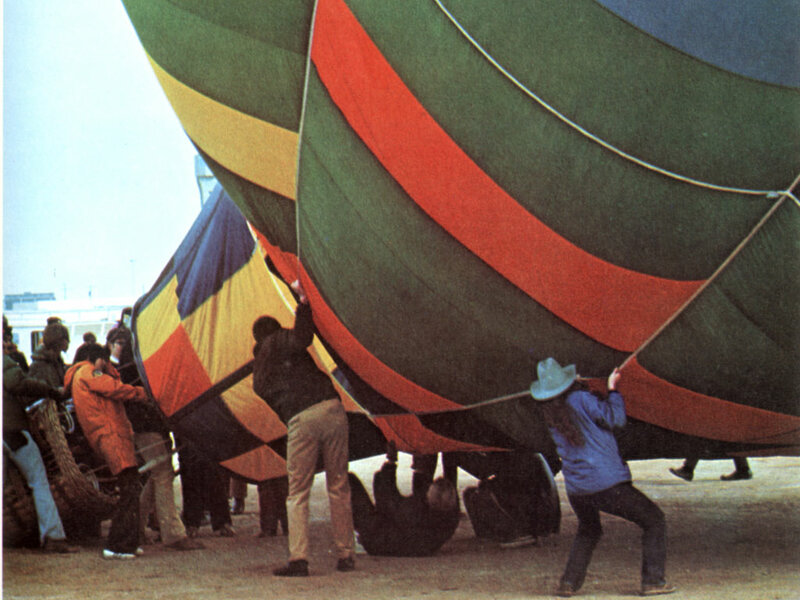 Extra-special thanks to Lance Terry, for the loan of his '78-'81 Ballooning magazines (and his shots of the "Body Helmet," above), and to Glen Moyer, for the generous permission to reproduce images from Ballooning. Finally, thanks to George Garcia Jr. for clueing me in to the page Don Piccard has put up, containing terrific images of classic Piccard balloons.